In a busy world, everyone need some free time for rest and relaxation, we think listen to music in car is a good way to relax yourself and you also can enjoy music time with your friends or family in trip so VIMVIP has a series of car aux cable for you to help you enjoy your life. This newest product VIMVIP Audi AMI to USB C Cable DAC HiFi AMI MDI Audio Aux Adapter Cord is designed for Car Audi A6L / Q5 / Q7 / A8 / S5 / A4L / A4L / A3 / A, WV GTI high 6 Passat CC and your type devices. Adopted latest version DAC chip offering 24 bits / 192KHz enables this type c to Audi AMI cable can support more type c devices and provide super sound quality, it compatible with Google Pixel 2 / 2 XL, HTC U11 / U12, Huawei Mate 10 / 10 Pro, Huawei P20 / P20 Pro, Xiaomi 6 / 8, Essential PH-1, LG, Essential phone, MacBook, Dell and more USB C devices. Wire of this usb c adapter applied fire-resistive materials to protector adapter and devices from high temperature. High quality aluminum connector has erosion resisting and electrical conductivity advantages prolongs life of adapter. 【AMI MDI Cable】: The type c to AMI MDI cable is designed for car Audi A6L / Q5 / Q7 / A8 / S5 / A4L / A4L / A3 / A (original car with AMI interface) and car WV Tiguan Tiguan GTI high 6 CC Magotan, etc. (original car with MDI-BOX interface)! 【Type C Connector】: AMI MDI to type c adapter compatible with most of mobile phones, pads, notebooks, players with usb Type C port, such as Google Pixel 2, Pixel 2 XL, HTC U12, U11, U Ultra, U11 Eyes, Bolt, U Play, Motorola Moto Z2, Z Droid, Z Force Droid, Z Play, Z3 Play, Samsung Galaxy S8 S9 Note8, LG V30, Essential PH-1, Razer Phone, Asus, Sony, BLU, Huawei Mate9 Mate10 plus, Xiaomi 8 7, OnePlus5 / 5T, Nokia, Nubia and Apple New Macbook. 【DAC Chip】: This Audi AMI to USB C adapter cord is adopted newest DAC Noise Reduction Chip, Hi-Res up to 24bit/192KHz, flawless music transmission and HIFI sound quality. 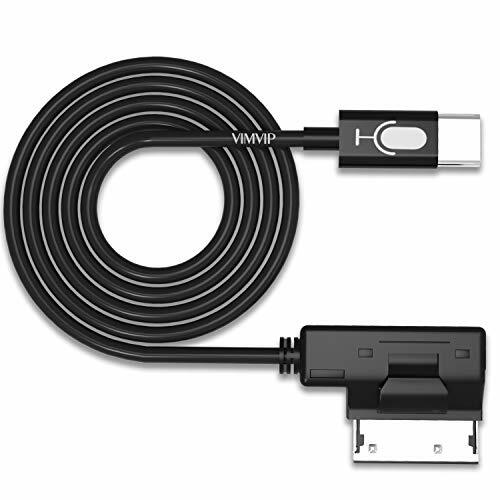 【1M/3.3FT in Length】: It is long enough for you to connect your car Audi AMI or WV MDI interface to your type c devices to play music. Enjoy high quality sound to relax. If you are looking for a high quality type c adapter you can refer to (http://a.co/gv1EimH). If you have any questions about this product by VIMVIP, contact us by completing and submitting the form below. If you are looking for a specif part number, please include it with your message.